Go to Help –> About Photoshop, while holding down [Ctrl]. 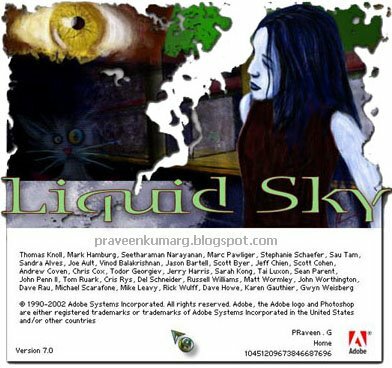 The Liquid Sky splash screen appears. Now, press [Print Screen], click File –> New and paste the clipboard contents using [Ctrl] + [V]. Now switch to the Channels palette and click the Red, Green and Blue channels one at a time. Notice the eyes of the cat move. Change the Hue using [Ctrl] + [U] and an interesting effect comes your way.